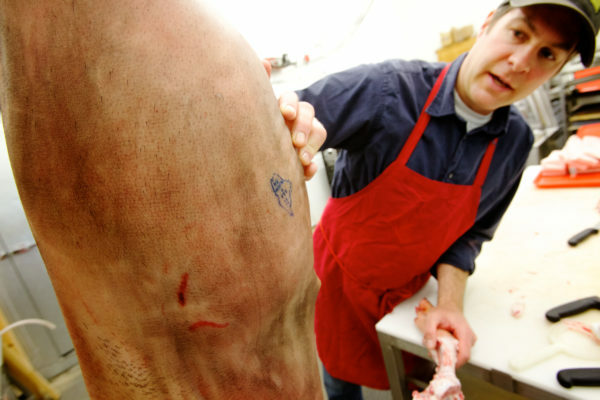 Butcher Ryan Goodrich looks at a Maine inspector's mark on a side of Pork at Farmers' Gate Market in Wales. Gov. Paul LePage has told legislative leaders that he will call an emergency legislative session to amend a food sovereignty bill that the federal government has criticized as unlawful. A separate issue LePage says needs fixing during a special session is a funding snafu involving the Maine Office of Geographic Information System, which was identified in early August. The food sovereignty bill, LD 725, proposed by Senate Minority Leader Troy Jackson, D-Allagash, received strong support in the Legislature and was signed into law by LePage in June. It allows municipalities to regulate local food systems, including production, processing, consumption and direct producer-to-consumer exchanges, which are currently regulated at the state and federal levels. The law, which is the first of its kind in the country, will take effect Nov. 1, but LePage said in an Aug. 29 letter to lawmakers that it needs to be amended immediately. Specifically, he wrote that meat and poultry must be excluded from the bill so that state officials can continue to regulate those products. “Although I appreciate the intent of this bill, it must be amended to ensure compliance with federal law. … The United States Secretary of Agriculture, as he is required, has served notice to me that he is preparing to exercise federal control of all meat and poultry slaughter and processing unless LD 725 is changed immediately,” wrote LePage. The Maine Meat and Poultry Inspection program operates by permission of the federal government, but only as long as the federal Department of Agriculture maintains statewide jurisdiction, according to LePage. The USDA has threatened to put Maine into “designation status” for federal inspections unless changes are made to the law. Jackson said Wednesday that he had seen LePage’s letter but so far has not received any correspondence from the federal government. According to a July 6 letter from the USDA to Maine Agriculture Commissioner Walt Whitcomb, states must maintain meat and poultry inspection programs that are “at least equal to” federal rules. The funding issue involving the Maine Office of Geographic Information Systems arose because of a LePage proposal to create a state Department of Technology Services, which the Legislature rejected. The Legislature did not restore previous funding streams for the office, which coordinates mapping activities in Maine that support a range of services. LePage did not say when he would call a special session. The Senate was expected to return this fall to take confirmation votes on a number of gubernatorial appointments but the House is not scheduled to come back until January. The Legislature adjourned last month with a couple of other outstanding issues, including marijuana legalization and the ranked-choice voting law.